The Collection holds about 100 items relating to local poet Per Sivle, including books, photographs and large and small memorabilia. Items on display include Sivle’s christening bonnet and ABC book, a set of cups and the special “wood nymph” brooch. There are early editions of his published works. Per Sivle was born in Flåm in the municipality of Aurland in 1857, but grew up on Sivle Farm at Stalheim. 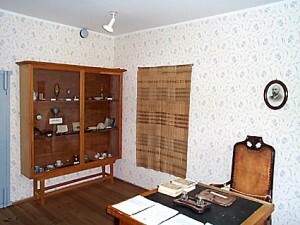 His daughter Sussie Sivle presented the collection to the municipality in 1953 and it can now be seen in the local history centre in Aurlandsvangen.